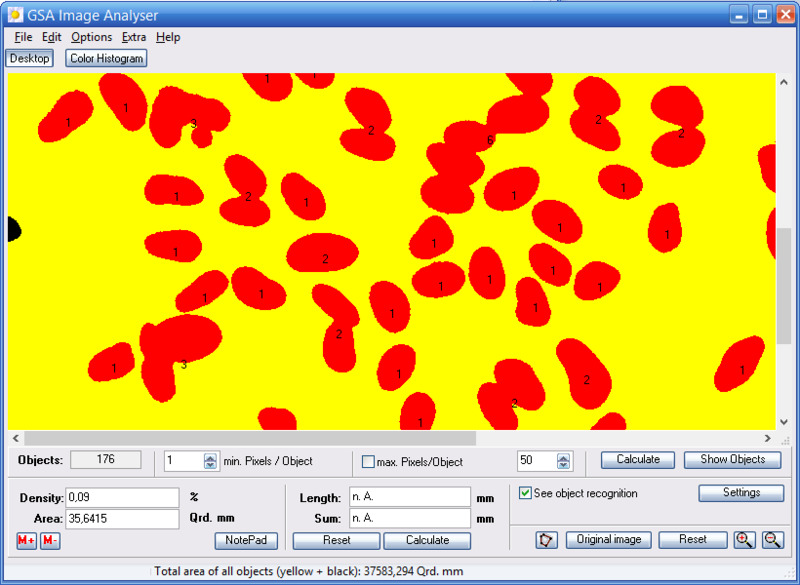 The GSA Image Analyser is a program for the scientific evaluation of 2D images (image analysis). The possibilities of the program are varied and can be divided in three main groups; Object surface calculation, Object length calculation and Object counting. The surfaces of all recognised objects are automatically calculated. In addition, the surface calculation of single objects is possible. The program offers the possibility to calculate the relations of the ascertained surfaces to each other and to the whole image or background. The GSA Image Analyser has a set of functions which have been developed especially for the direct length calculation of very complex and very ramified objects. Such objects are for example plant roots. In addition to the direct length calculation, an indirect calculation with a grid intersection (developed by Tennant) is possible. For this function, the grid size can be freely defined. The automatic count function determines the number of all recognised objects and, in addition, offers the possibility to count overlapping objects apart. This separation can made over the object form, the object surface and over the object intensity. The grid intersection count function serves for the indirect object number regulation. Such procedures are described, e.g., by Buerker, Fuchs Rosenthal, Thoma, shilling, Tuerk. Beside the automatic count functions, the program has two manual count procedures included. One method marks the objects inside of the image and the other cuts the image into several smaller parts to make it easier for human eyes to follow many small objects. The GSA Image Analyser can read almost all known picture formats (JEPEG, GIF, TIFF, BMP, PNG). In addition, the program provides interfaces to scanners, microscopes and digital cameras (TWAIN) as well as to video cameras (Video grabber, TV cams). This program is designed to solve many problems. It has been used for counting cells and calculating the size of plant roots (biometry).